I think I’m going to have to talk my wife into becoming Fashion Editor for the site. The clothing that designers are 3D printing is becoming more beautiful and more wearable, and definitely more prevalent. A month ago we published photos and video of breathtaking designs shown at Paris Fashion Week. And today we bring you another astonishing fashion design. Last night Shapeways wowed fashionistas at the Ace Hotel in New York with a 3D printed gown that was worn by none other than queen of burlesque Dita Von Teese. 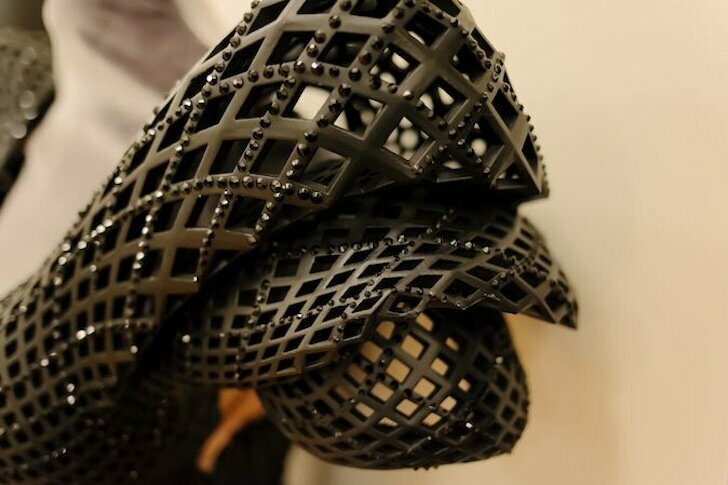 The gown, designed by Michael Schmidt and 3D modeled by architect Francis Bitonti, is fully articulated based upon the Fibonacci Sequence, printed in 17 nylon pieces by Shapeways, and then painted black and adorned with 13,000 Swarovski crystals. Don’t miss the accompanying video produced by Michael Schmidt, to see how it all came together.